Chicken chain continues Georgia growth. Atlanta-based Popeyes Louisiana Kitchen is going forward with their planned location on LaVista Road near Northlake Mall. The new freestanding restaurant will open in place of a shuttered package store and a number of smaller businesses. The restaurant sits across the street from a McDonald's and adjacent to a Wendy's. 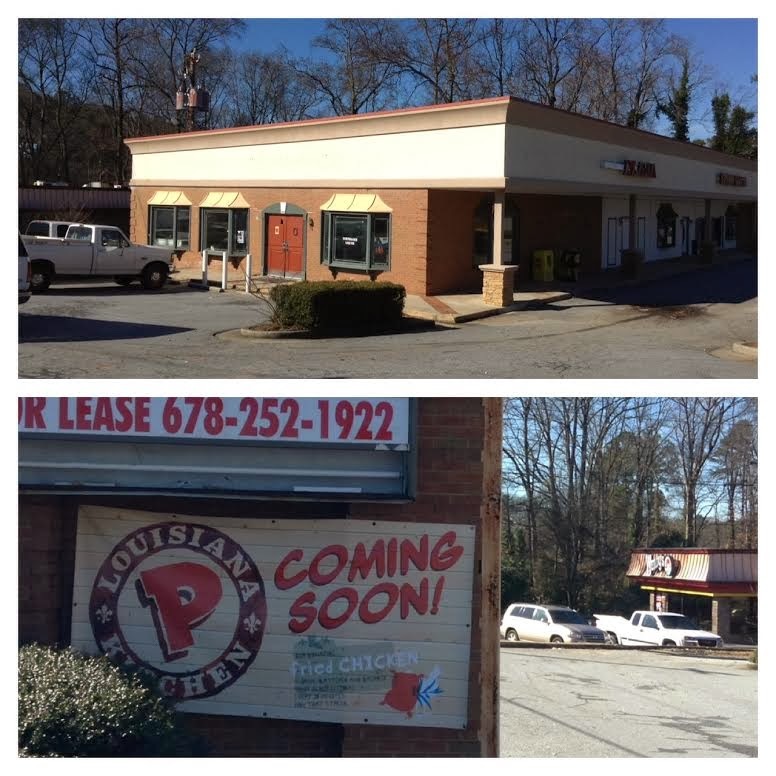 Popeyes locations were also planned on Peachtree Industrial Boulevard in Chamblee and North Druid Hills Road near North DeKalb Mall but those have apparently been abandoned. It took me over three months to get a response from Popeyes corporate headquarters in Sandy Springs, but I finally got word this week that the Chamblee and North Druid Hills locations are "no longer in the pipeline." The Northlake location, as well as another on Highway 53 in Calhoun, are being developed by National Restaurant Development LLC, a franchise operator based in Atlanta. In addition to Popeyes, NRD also operates Subway and Rally's restaurants. The Northlake Popeyes is slated to open at the end of March with the Calhoun location on track for an opening at the end of May. Additional Popeyes restaurants are reportedly in the works for Cartersville and Loganville. Wow! First we got Panda Express, now Popeyes! Northlake is now on the culinary radar. I suppose the Northlake location should do ok. The McD's and Wendy's have obviously been there for many years. Wow, Northlake is really hopping with fine dining such as Panda Express, and now Popeyes. Seemingly, it should do ok there. The McD's and Wendy's have been there for years--although the Arby's did disappear a few years ago. The City of Chamblee would not approve a drive-thru on the old Checkers site, so I'm sure that's why they pulled out. Who goes to Popeye's to eat healthy? You do know it's fried chicken right? Don't like it, don't eat it..it's pretty simple.